Sometimes a single tooth becomes discolored causing it to look out of place with the rest of your smile. In these cases you may want to consider having the tooth whitened to match the rest of your teeth. How much can a tooth be whitened? How white an individual tooth can become from bleaching and whitening is a common question. Some whitening procedures claim they can whiten your teeth by up to nine shades, but that is highly unlikely. A change of two or three shades will make a significant difference in just about anyone's smile. Not all of your teeth are the same natural color. As strange as it may sound, usually your eye teeth are darker than the others, and your front teeth are almost always the whitest, and molars tend to be a shade between those two. When your cosmetic dentist is whitening one particular tooth, they will take this into account. The goal for everyone is to achieve an overall whiteness while still looking natural. During your first consultation for tooth whitening, your dentist will go over what you personally can expect for your specific smile. How a white tooth will become will vary from person to person. The structure of your tooth and the type of procedure implemented will affect the outcome. The following chart will give you some idea of what to expect. As everyone's circumstances are different, options should be further discussed with your cosmetic dentist prior to making a decision. Most people are not seeking a gradual whitening of an individual tooth. The laser whitening procedure affords the cosmetic dentist the needed control and the patient the instant results sought. People typically have a tooth whitened to improve their appearance. Teeth that are all of the same bright color are associated with beauty and a healthier lifestyle. When people have a brighter smile, they tend to smile more often and are less self-conscious. Although tooth bleaching is very effective, there can be short term disadvantages, such as sore gums or tooth from the bleach. This disappears when bleach use is discontinued. Some individuals are more chemically sensitive. If you are one of them, inform your cosmetic dentist so that you can be tested for sensitivity to the solution. Research indicates that tooth bleaching is completely effective in more than 78% of people. In cases of serious tooth discoloration, bleaching may not be the best choice. Veneers or crowns may be the superior choice. Bleaching is usually the first solution to try due to its lower cost. Tooth whitening is used to correct discoloration of a tooth by removing the brown and yellow staining. The term "tooth whitening" or "tooth bleaching" can refer to a number of techniques to improve the brightness of the patient's tooth. Among them are chemical whitening, mild acid whitening, abrasive tooth brightening and the newest technique, laser tooth whitening. 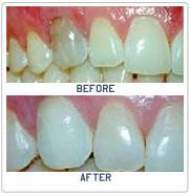 Tooth bleaching is chemical process used to lighten the color of a patient's tooth. The procedure can be performed entirely in the cosmetic dentist's office in only one or two visits.Your cosmetic dentist may first try a regular abrasive cleaning of the tooth. This may be followed by a bleaching process on the stained tooth or teeth. Severely stained teeth may require the use of a special whitening gel activated by a laser. Your cosmetic dentist will carefully lighten the tooth until a near-perfect color match with your other teeth is achieved. Tooth whitening is not a permanent procedure. Results can last for one or more years, depending upon your personal habits. In most cases, the tooth whitening procedure is very effective and the patient is pleased with the results. There are a few tooth whitening procedures available that correct discoloration of the tooth by removing the brown and yellow staining. While each work effectively, there are advantages and disadvantages to each procedure dependent upon your objectives and commitment to the processes. The type of procedures available should be discussed with your cosmetic dentist, and a they will recommend the most appropriate tooth whitening procedure for you. A small amount of the bleaching abrasive is applied to the tooth. This is the most common technique because it costs less, but is most effective for mildly stained teeth. This procedure is sometimes used in conjunction with the in-office laser bleaching if you have severe discoloration (dark gray or purple) or internal tooth staining. Often an alternative to crowns, veneers are very thin pieces of specially-shaped porcelain or plastic that are glued over the front of your teeth with little or no anesthesia needed. They are the cure for teeth that are severely discolored, chipped, have small holes or pits, misshapen or crooked, or for the correction of unwanted or uneven spaces. Unlike crowns, veneers won't require the dentist to remove much of the tooth itself. Veneers are created from an impression taken in your cosmetic dentist's office. Your custom veneer is then glued directly onto your tooth. Typically costing less than crowns, veneers won't stain, making veneers a very popular solution for many people seeking that perfect smile. Strong and very durable, veneers last from ten to fifteen years, and come in colors that will brighten dark teeth without the worry of them changing color.